Many landscape projects begin with the question, “where do we start?” Quite possibly the most important phase of a successful landscape project lies in the planning. While, in the end, beautiful, most landscaping does serve a purpose or as a solution to a problem. Proper drainage, ground stabilization and screening are just a few things that need to be addressed prior to putting a plan into action. During the consultation phase, our designers will spend time with you to learn the site, listen to your thoughts and goals, and begin to discuss how we can get there. What is the ultimate end result you are looking for? Do you have a timeframe in mind? 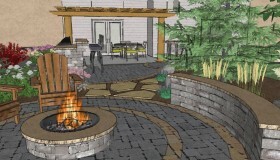 Have you ever worked with a professional landscaper before? How do you see yourself using the new landscaping? What level of maintenance are you comfortable with? What is most important to you in your decision to hire?